March is the month to don some green, pull out the shamrocks, and look for the pot of gold. St. Patrick's Day is approaching, spring is arriving and every one is ready to celebrate and enjoy good cheer. For many St. Patrick's Day has become a popular night out to celebrate with friends and family. Unfortunately, due to the large number of drunk drivers, the night out has also become very dangerous. On St. Patrick's Day 2008, 37 percent of the drivers and motorcyclists involved in fatal crashes had a blood alcohol content (BAC) of .08 or above, according to statistics by the National Highway Traffic Safety Administration. "Whether you are meeting a few friends at the local pub after work or attending parade, if you plan on using alcohol, never drive while impaired-and never let your friends drive if you think they are impaired". 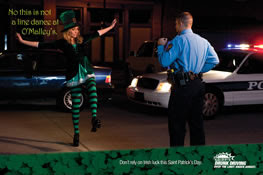 Additional NHTSA statistics show that in 2008, there were 134 crash fatalities on St. Patrick's Day. Out of that number, 50 people were killed in traffic crashes that involved at least one driver or motorcyclist with a blood alcohol concentration (BAC) of .08 or higher. Driving impaired is simply not worth the risk, not only do you risk killing yourself or someone else, but the trauma and financial costs of a crash or an arrest for driving while impaired can be really significant. Don't depend on dumb luck this St. Patrick's Day. Designate your sober driver before the party begins.